Imagine. All those cards, all those stamps (though it does solve the problem of what to get her for Christmas…stamps are us), all those days. A life unscrolling a day at a time. A carefully edited life for sure, but the narrative does include some down days, some sadnesses, lots of food and cooking and singing and friends and family…a life in Vermont so very different than our own left-coast life. Along the way she has found satisfaction in condensing a day into two succinct and often-witty sentences and for searching for post cards wherever she goes. In the last few years the cards have been arranged in series (check this or this) and then there are the occasional “Bonus” cards…the “poultry bonus card” (chickens) certain favorite cards like Gibsons in Oberlin…and then the “topical Bonus Card” (when she is actually in the card-location). And being archivally oriented, we at our end have saved them all. Ellen doesn’t want to see them ever again she says, but they are a wonderful journal of a life well lived. Everyday comes a couple of sentences and at our end we await the cards arrival. Some days it is the one card, some days (like today for instance) 6 arrive at once. Sometimes a card arrives weeks later out of sequence and we wonder where has it been? 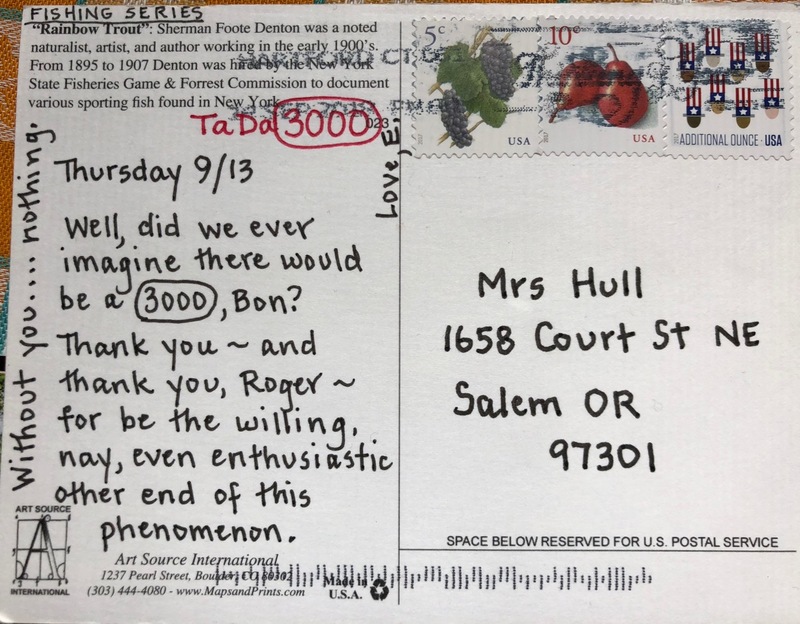 We have discussed the sadness of the end of the snail blog when the writer or the archivist is no longer here, and each milestone reached I wonder if this might be the last…but 3001 arrived today…on we go. XO Ellen. XO. What an excellent way to communicate. 3000 and 8+ years is indeed an accomplishment! I send our grandchildren a postcard about every two weeks, just because I believe they like to get mail. Sometimes I send funny ones, like “They grow um BIG in Idaho” and it has a giant potato on a flat bed truck. Not sure my sense of postcard humor is appreciated. I only know that one, Jake, has expressed his enjoyment of the cards — once I did a hand colored postcard to each — he told me later that it got lost when he moved and he was so sad — so I made him another one. Guess that is enough to keep me going — sometimes I imagine them receiving them with a little smile. 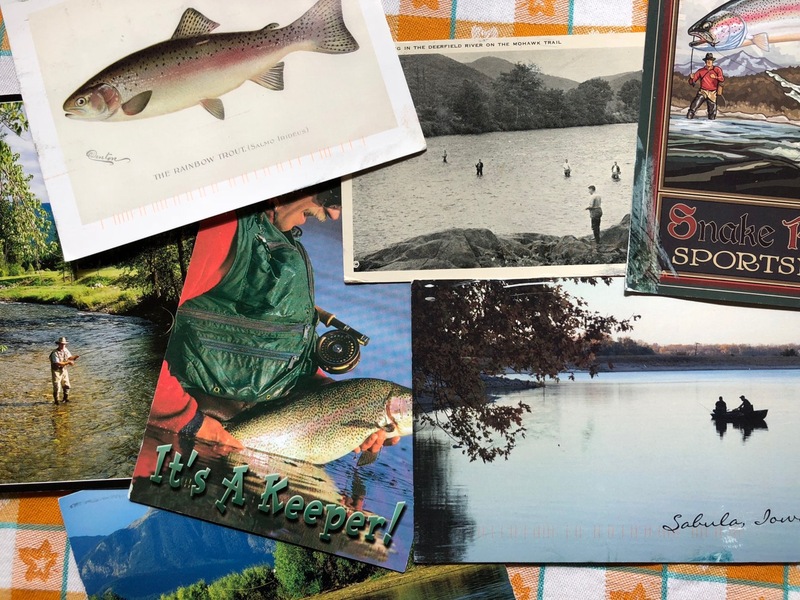 I am loving following Salemite Vicki Hardin Woods with her letter writing campaign — one each day for 365 days. She is on the downward side now, having begun New Year’s Day. I even received one from her and it was so deeply thoughtful it prompted me to write her one back, as quite a few have done. 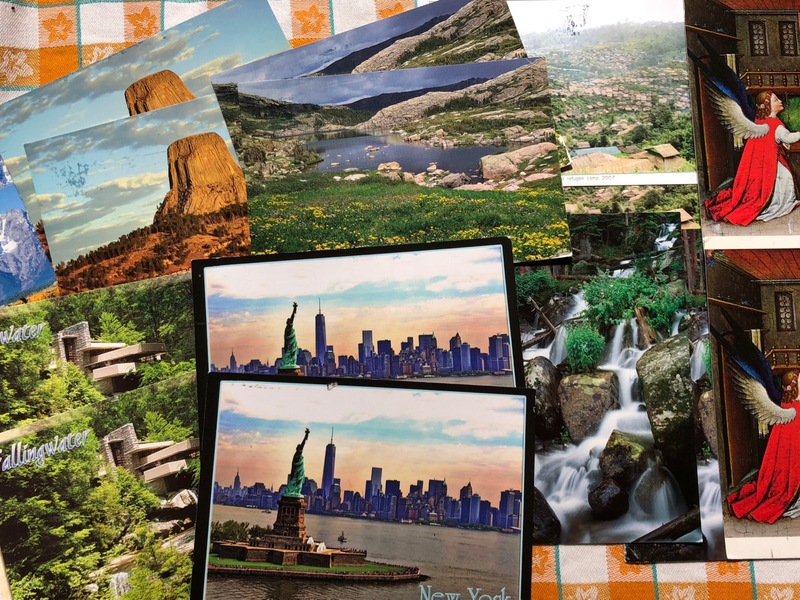 I say never doubt the power of a handwritten communication — postcard, letter or however one does it…it means a lot to know that someone has taken the time to send something to only YOU…. I think this is such a lovely way to keep in touch. Much better than what I did, calling my mother every Sunday for over 10 yrs. after my dad passed away. Wish we had sent cards. I would still have them. Oh the calls are so good though…every time I called my Dad he’s say the same thing “Well Bon, I’ll be dipped” and it made me laugh every single time! Wow, that is quite a commitment. $1050 just in postage. Wonder what she paid for the cards? A buck each? And then there is the time. Don’t think I would have enough to say for 30 days. Or 10 days. This is sorts Guinness Book of Records material. Could be an amazing show. Kudos to Ellen. bruce decker i love you! your kind (males) mapped space. right/left, etc. what would we do without your vision on things? $1050 just in postage. indeed. guinness book of records material, as well as the delicious fate of having bonnie hull and roger hull as friends…natural preservationists/archivists. love your response here. 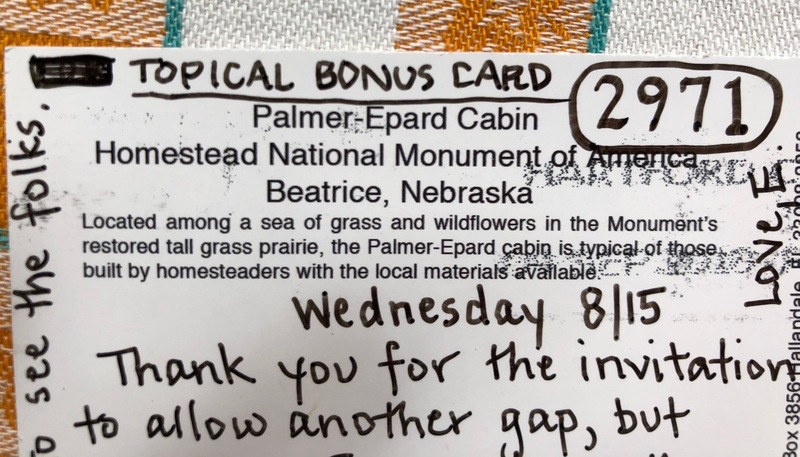 i’ve been all over the poetry of this 3000 snail mail communication and never once thought about the details. believe me, i am grateful you added this other way to “see”. I happily remember visiting you and Rog and seeing three cards arrive. Then you were kind enough to let me see them all. I will never forget that, and the joy of even remotely touching this beautiful phenomenon. Bravo Bon, Rog, and Ellen!! AMAZING !! Has your post-person ever commented on the cards ? Love this so much, in so many ways. Thank you for sharing! Great post! Brings forth wonderment and smiles.